Skyko International delivers value with their non-metallic easy locking PCA Connector. 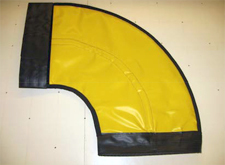 Our insulated PCA Layflat Duct incorporates a 10 oz/yd inside liner of polyester reinforced vinyl membrane. This material contains an anti-fungal, anti-bacterial treatment to prevent mildew and mold growth. A closed cell foam insulation material is installed between the inside liner and the 18oz/yd PVC coated fabric outer covering. 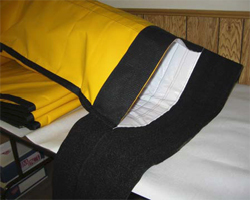 These fabric qualities combined provide excellent abrasion and low temperature handling capabilities. This allows for the duct to be easily rolled up for storage. Six inch Velcro [hook & loop] couplings are standard for easy and positive assembly of components. Continuous lengths up to 40 feet with optional end connections are available. Starter Section - KD12X12MEMC Machined End-Velcro, 12" dia., Soft cuff one end and Velcro [hook (Male End) ] the other end. Layflat Ducting Section - KD1210ILFMF, 10 foot long 12"dia insulated layflat PCA duct, W/Velcro[hook (MALE END)] one end and Velcro[loop(FEMALE END)] the other end. Layflat Ducting Section - KD1225ILFMF, 25 foot long 12"dia insulated layflat PCA duct, W/Velcro[hook (MALE END)] one end and Velcro[loop(FEMALE END)] the other end. Aircraft Adapter Section - KD12X12MEFC, 12"PCA Machined end, W/Velcro Flap[loop (FEMALE)] one end & 12" Soft Cuff one end. Aircraft Adapter - KD112, 12" PCA x 8" Aircraft Adapter (optional). The construction of the machined ends takes into account their connection to rigid connectors. 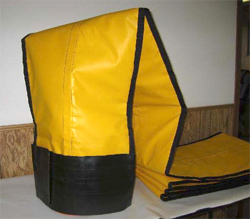 Constructed of single ply 36 oz/yd heavy duty PVC coated fabric with Velcro (hook &loop), these sections provided heavy duty and positive connections from the pca power units and aircraft adapters. Six inch Velcro (hook & loop) end connections are standard assuring total interchangeability. Insulated 45 degree and 90 degree layflat pca elbows are designed for smooth airflow. Optional end connections are available. Six inch Velcro (hook & loop) end connections are standard assuring total interchangeability.